Welcome, welcome to my library today. 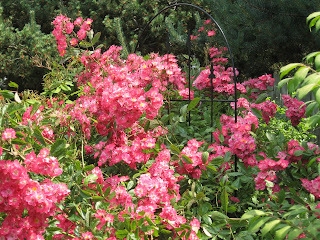 The morning sun shines low in the sky creating long, dark shadows in my grotto. 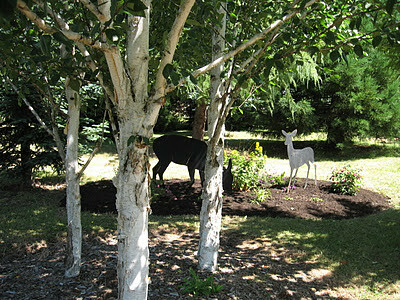 It streaks through the tree branches and forms a bright spotlight on the trunks of white paper birch trees. Brilliant sunlight causes three white trunks to glow in the darkness. This scene reminds me of a dazzling reality Peter, James and John experienced centuries ago. 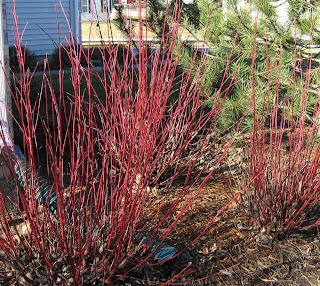 A red twig dogwood bush also glows this morning. In spring and summer, tiny leaves and insignificant flowers are not worth mentioning, but now naked and bare, red twigs glow in the sunlight. Remember our Sunday School chorus, “Sunlight, Sunlight in My Soul Today”? Have you ever seen a huge number of little birds fly in formation? They don't fly in a “V” as geese do, but thousands of them fly in a sheet. In a split second, they all turn left, then turn right. I question who blows the whistle to signal time to turn. They don't come here to perform, but I've seen them several times flying over fields along I-5. They are so fascinating to watch, but they take flight in a flash with no time to take a picture. I searched the Internet for a picture of this fascinating display to show you, but none could be found. I hope your day is full of sunshine, inside and out. Hi, let's have tea together. Do you want payment for cleaning your house? No, I don't mean paying someone else to do it. This week, I've been preparing for a large group of ladies at my house for ministry training by Marguerite. Fifteen ladies became a definite incentive to clean places not touched by human hands in several years. My cleaning list included a hunt for cobwebs and cleaning windows with the magic, tacky rags I recommended recently. I'll tell you a secret. (Men, don't read this paragraph.) My favorite husband doesn't carry a coin purse (purse? ); so, he lays lose change all over the house wherever he takes off his pants. Years ago, I began claiming this money as my special fee for cleaning up after my dear husband. It's low wages, but stealing it makes me feel good and he never misses it. If you multiplied the weekly heist, I'd be rich after these forty-eight years together. I also keep the 'clean' money found in the washing machine. One special place I needed to dust was this library. Several ladies acted excited to see where I sit and write my letters to you. I wonder if they got the same thrill as people do visiting Robert Louis Stevenson's home in Samoa? You must know I'm teasing. But I really have been to Samoa, another ministry trip many years ago. I took my tennis racket with me, but it was too hot to play on that South Pacific island. We don't need the sun to make sun tea. I proved it this weekend. If I'm not careful, I'll be sounding like “Hints from Heloise”. Please forgive me. You know the Oregon State beaver, but have you met the OSU catapiller? Harold doesn't know what this feller becomes. Do you? Thanks for joining me in my tidy library this week. Can you stay for another cup of hot tea? Welcome, I'm glad you came to visit. It's too late to alter the layout of my library. We didn't think to design the placement of our windows to give us pleasure of seeing the sunrise in the morning or watching the sun set. I see one alternative and I imagine you're way ahead of me on this one. I might go outside early and actually be in the moment. This week, the sun rises at 7:25, which certainly is not too early for us, but we'll need to wait for partially clear skies in the morning to see a gorgeous sunrise. Last year, I planted twelve Robin Hood roses, making a carefree hedge down our long driveway. I hope the people in the new subdivision, formerly a filbert orchard, will see and enjoy them as well. To make a portable greenhouse, I placed a 30-oz. clear plastic peanut butter jar over three cuttings. I find this an easy way to start own-root roses in the winter. This system brings success every time. 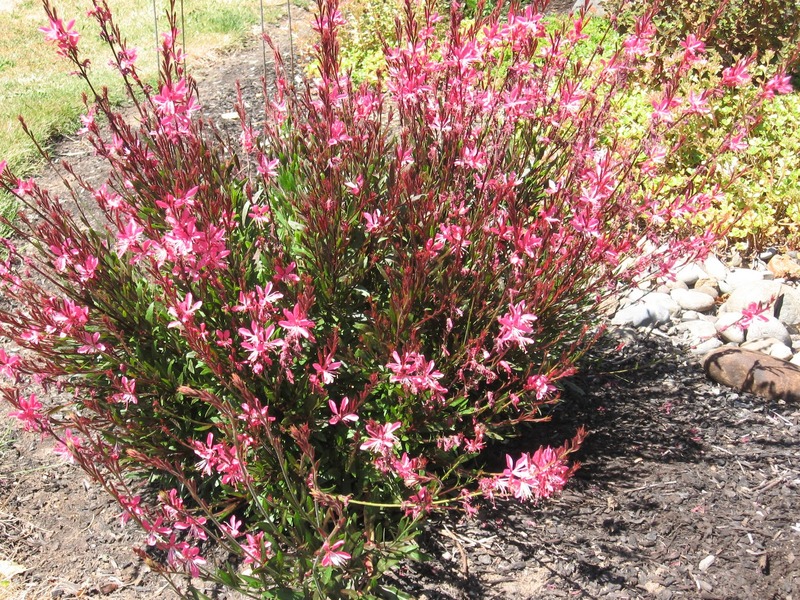 By late spring, the trimmed twigs will show new growth and you can remove the jar. Looking out the window now, I see blue sky and not one cloud, making the perfect day to plant a new row of pale pink Baby Blanket roses using the plastic jar method. I enjoy this rose because it continually blooms all summer long and still blooms in October after the rains arrive. My friend Vicky gave me a start from her Baby Blanket rose bush many years ago. Today, the view becomes brighter and more beautiful the longer I sit here, but we valley people know how quickly our weather can change. I need to move outside without delay while the sun is still shining. A Happy Autumn Day to you. Last week I discussed the difference between autumn and fall. My dictionary describes the autumn of life as the early stages of decline. Well, I resisted this scarey thought immediately. I'm not brave enough to read how it explains the cold winter of our lives. Carolyn, be faithful to Curves and I'll walk more miles. As I sit in my cozy library reading and meditating on God's Word, I see my six-foot tall sunflowers along our neighbor's barn wall bowing their heads. Looking weary with age and heavy with moisture, they barely stand up straight. Their days are numbered, but spring will return and more seeds will be planted and again produce beauty to behold from my window. He owned a rusty backhoe for years, but recently sold it with an agreement he may borrow the machine when needed. He uses this “toy” to move and flatten the pile of brush for a complete burn. He usually drives to get it, but today he walked! Am I proud or what? I'm not sure which is more exciting for him: operating a large backhoe or building a huge, red-hot fire. 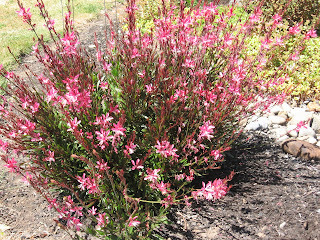 I'm showing you a close-up of last year's burning bush. 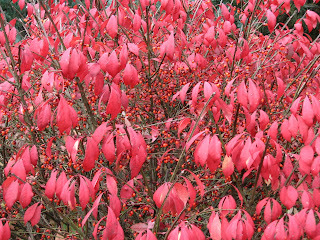 We planted five such bushes and they're now just starting to 'burn' with red autumn colors. The official name is dwarf burning bush euonymus, but don't let this name fool you because they grow to ten feet tall at maturity. Let's go for a walk and enjoy the colors of the season. Good morning! Welcome to my library. Welcome to autumn, officially here with its bright array of warm colors. 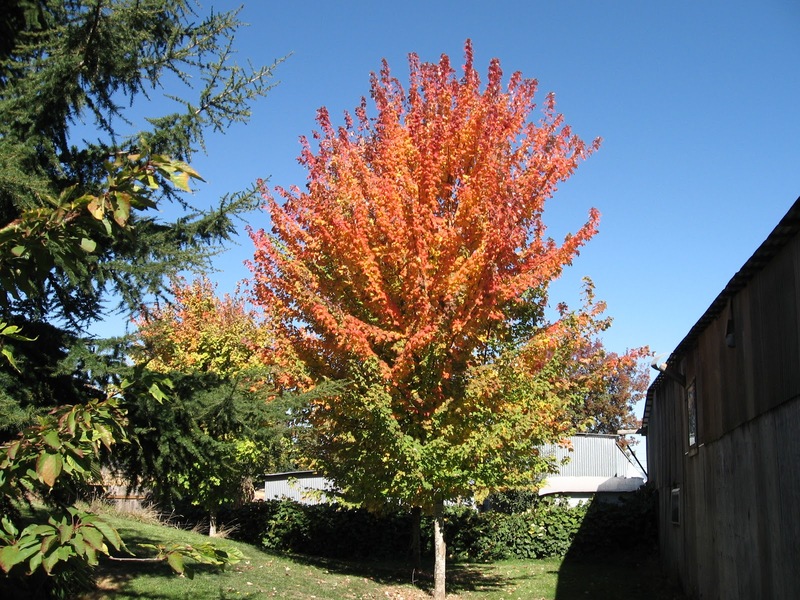 Do you prefer to label this season autumn or fall? If you call yourself British English, you probably say “autumn”. In support of saying “fall”, leaves fall from trees and temperatures fall, but I prefer the word autumn. The sound of this word lingers and hums when spoken, much like our six-foot, steel gray wind chimes Jack made for us six years ago. They are perfectly tuned to an E-flat cord. When the breeze stops, our chimes hum for over two minutes. In case you're wondering about this melody disturbing our neighbors, they are not close enough to hear them. Their loss, our joy. On another topic, what's up with the praying mantis this week? Why are they jumping on me? I know they eat little insects, but I saw no bugs on me. They are so weird-looking in an elegant way. I was minding my own business, pulling up purple petunias which quit blooming, and trimming my dark pink guara when I see a lime-green prehistoric monster on my shoulder for the second time in a week. I didn't scream this time. Once again, no camera with me. I need to consider myself a journalistic photographer and keep my camera tied to my belt when I'm outside to avoid missing these unusual shots. Pink Guara in my garden. I'm amazed how many visitors join me in the library each week. Thanks for coming. Comments are welcome at folks7777@gmail.com or click on pencil below.